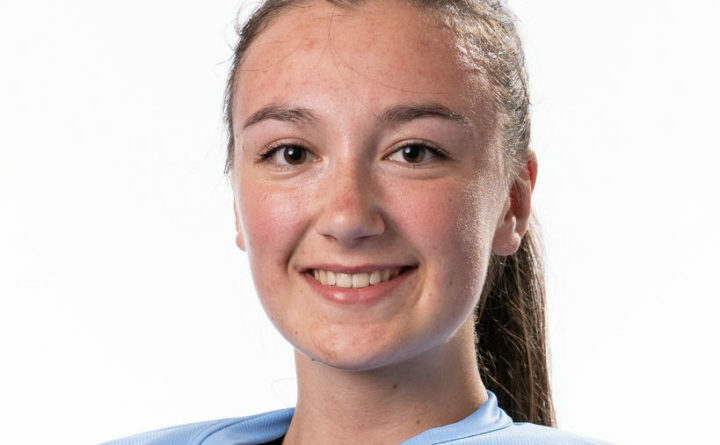 ORONO, Maine — Mia Borley is not just the starting goalie for the nationally ranked University of Maine field hockey team. The freshman from England also happens to be the only goalie on the roster for the 19th-ranked Black Bears. Even so, no one in the program seems concerned about the fact they don’t have a backup goalie. “When I was at Albany, we won an America East championship with just one goalie. It’s not uncommon,” said UMaine associate head coach Michelle Simpson, who played and coached at Albany, and is English as well. UMaine head coach Josette Babineau said she and Simpson have “thrown some names around” of field players who could fill in if Borley got hurt. “It would depend on the situation,” Babineau said. “We could also put someone in to play up [and play without a goalie]. In field hockey, players can’t score if they are outside the circle, which would prevent a team from taking long shots at an unattended cage. Babineau indicated there are some former field hockey goalies attending UMaine who are not on the team. The 5-foot-7 Borley didn’t have a designated backup when she played in England, either. So far, Borley has helped the Black Bears post a 3-0 record, including back-to-back 2-1 wins over No. 19 Boston University (2-1) and No. 24 Ohio State (2-1 in overtime) last weekend in Boston. “Her quickness and skill level are the best we’ve ever had from a first-year goalie,” said Babineau, who is in her 12th season at UMaine. Borley was named the Longstreth/National Field Hockey Coaches Association Defensive Player of the Week and the America East Rookie of the Week after making seven saves in the two wins. Her 0.98 goals-against average is 15th best in the country. Babineau said Borley has a keen understanding of the game and a positive demeanor. Borley said she has learned a lot, especially about communication, in her short time at UMaine. Borley switched over from soccer to field hockey at age 12. “I was a center back but our goalie got hurt and the ball kept hitting me in the foot. I wasn’t afraid to be hit by the ball. So I dove headfirst into [goalkeeping],” Borley said. She has represented England and Wales at the international level, and has high-level club experience. Borley accepted a scholarship to UMaine because of the program’s reputation and the feel of the Orono campus. “It’s a really peaceful place, a really safe place like home,” she said. The Black Bears visit Quinnipiac University in Hamden, Connecticut, for games against the host Bobcats on Saturday and Lafayette on Sunday.